I first saw it on my favorite blogger of all time: Song Of Style. I may try to do it tomorrow, since i have pretty much all the colors. que cores lindas, quero-as todas! Go for it! I can't wait to see how it comes out!! Adoro adoro adoro, e ja tenho uns quantos!! Planeio mesmo pintar assim as cores misturadas no verao, ai calor volta! Loving anything pastel right now! Great inspo!! Oooooh so beautiful, I love these styles! 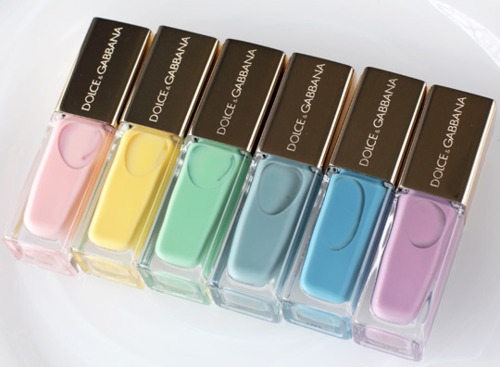 gosto imenso de todas as cores e nas unhas ficam fabulosas! é mesmo, fica um mimo!! i love all these colors!!! Love it! So beautiful colors! The pastel colors are beautiful :) LOVE it! I don't have nearly enough pastel colors.